Griffiths's MCS accredited installations are eligible for funding from the Governments 'Renewable Heat Incentive' scheme. It is a sad fact that climate change is happening and this poses a huge threat to our world, the major cause of this is the release of greenhouse gasses. To help reduce global warming we must reduce our Carbon Dioxide (Co2) emissions by using cleaner methods of generation and using energy more efficiently. Using a heat pump system to heat your home greatly reduces the energy required. GRIFFITHS are Approved Installers for the Daikin Altherma range of LT (low temperature) and HT (high temperature) air source heat pumps. These systems are equally at home in new or existing properties. The air source heat pumps work by absorbing heat energy from the outside air in a 'evaporator' fan coil unit, a refrigerant circuit is used to amplify the heat energy, which is then released into the central heating system (Via a hydrobox unit) to provide home heating or hot water. The generated heat energy can be used to supply under floor heating or radiator based central heating systems (Radiators are sized to the lower flow temperatures of the heat pump). 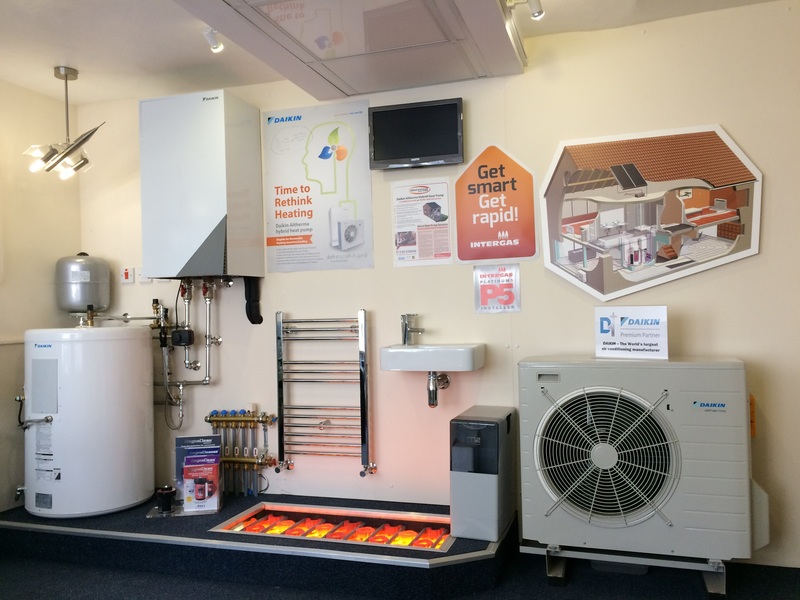 Heat pump systems are ideal for replacing oil and gas fired boilers, electric heating systems (such as night stores), night store compacts and electricaire units. Air to water heat pumps are highly efficient with typical C.O.P. 's of over 4 (one kilowatt of power will produce over four kilowatts of heat). This will reduce your energy consumption and fuel costs. Low Temperature heat pumps - 'Low Temp' heat pumps can generate water temperatures of up to 55ºC, this is the more common type of heat pump system which offer the greatest seasonal efficiencies. Ideal for new build properties or existing houses which have benefited from cavity wall insulation, double glazing and loft insulation. Griffiths purposefully design our heat pump systems with flow temperatures of 40-45ºC to return the greatest Seasonal Co-efficient Of Performance possible. 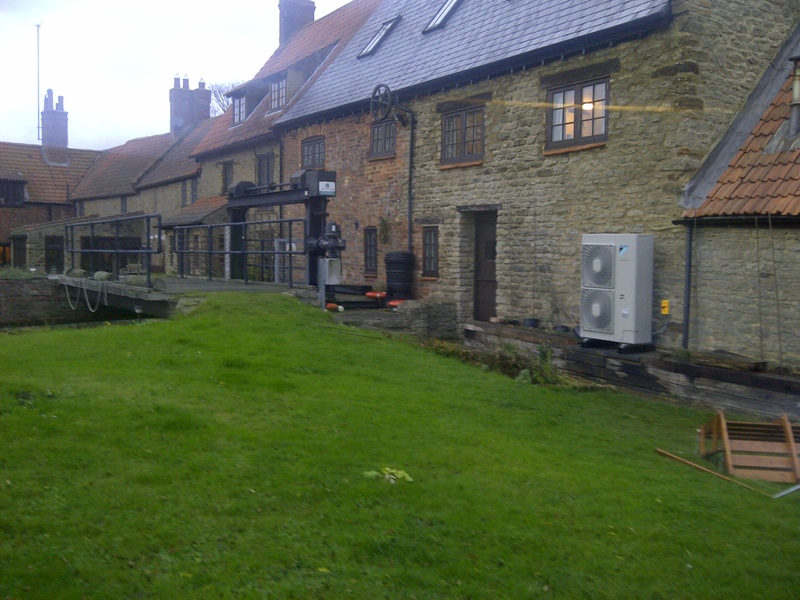 The low temperature heat pumps provide domestic hot water via a specialist cylinder. The heat pump 'pre-heats' the stored water, using an electric immersion heater to raise its temperature to around 60ºC. A working example of a Daikin altherma 'Low temperature' air source heat pump system can be viewed at Griffiths Energy Efficiency Centre. High Temperature heat pumps - 'High Temp' heat pumps can generate water temperatures of up to 80ºC. This system is suited to older or harder to heat properties where insulation improvements cannot be made to the fabric of the building, the higher temperatures of the system means that it can be installed onto existing central heating systems without the need to upgrade heat emitters. 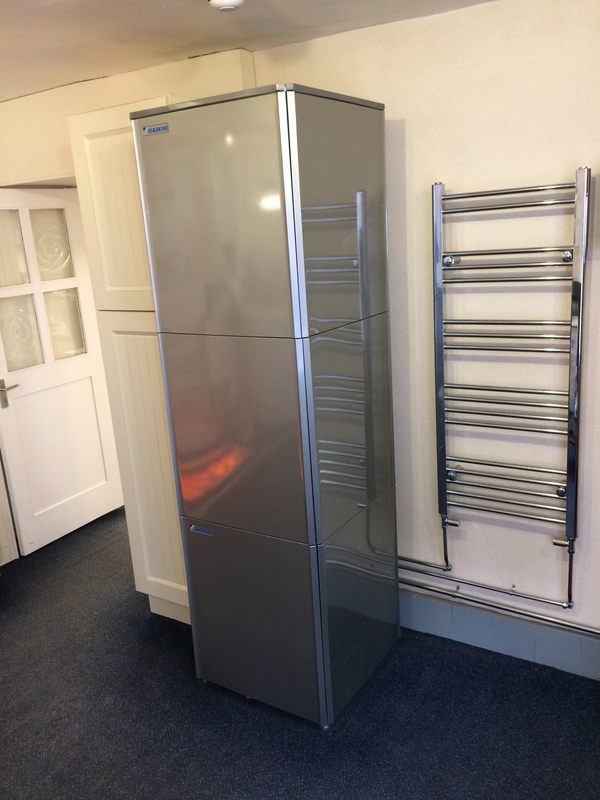 A high temperature heat pump is currently being used to heat Griffiths heat quarters, the system can be viewed at our energy efficiency centre on the high street Burton Latimer. Hybrid heat pumps - The amalgamation of a low temperature air source heat pump system and a modulating condensing boiler, providing 'High and Low' temperature outputs. The hybrid system offers the best of both worlds...Renewable energy heating during milder winter days, with a familiar condensing gas boiler providing supplementary heating during cold winter months. Please visit our dedicated Hybrid heat pump page for further information. Griffiths are proud to be a Daikin D1+ accredited installer, we can offer an extended 5 year parts and labour warranty on all our installations. Our service department specialist in the maintenance and repair of Daikin's Altherma system. Commonly referred to as a 'heat pump air conditioning system', the unit operates a 'heat pump' cycle which can be reversed to provide either cooling or heating within the property. Air to air heat pumps utilize an internal 'fan coil' unit which is usually wall/ceiling mounted or concealed in a loft space, to provide circulated temperature controlled air throughout a room/rooms. 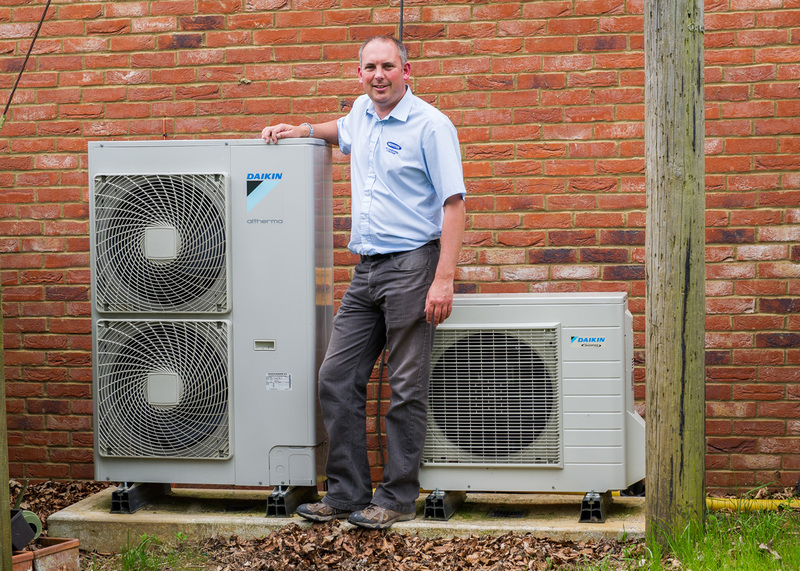 Griffiths are a Daikin D1+ accredited installer of air conditioning heat pump systems, as such can offer an extended 7 year warranty on all equipment. Although you may not know it, heat pumps are very familiar to us – Refrigerators and air conditioning units are both examples. A heat pump utilises a refrigeration circuit to extract heat from one energy source (air or the ground), amplifies the low grade heat (absorbed in the refrigerant) using a compressor, then via a heat exchanger distributes the heat energy to a property. 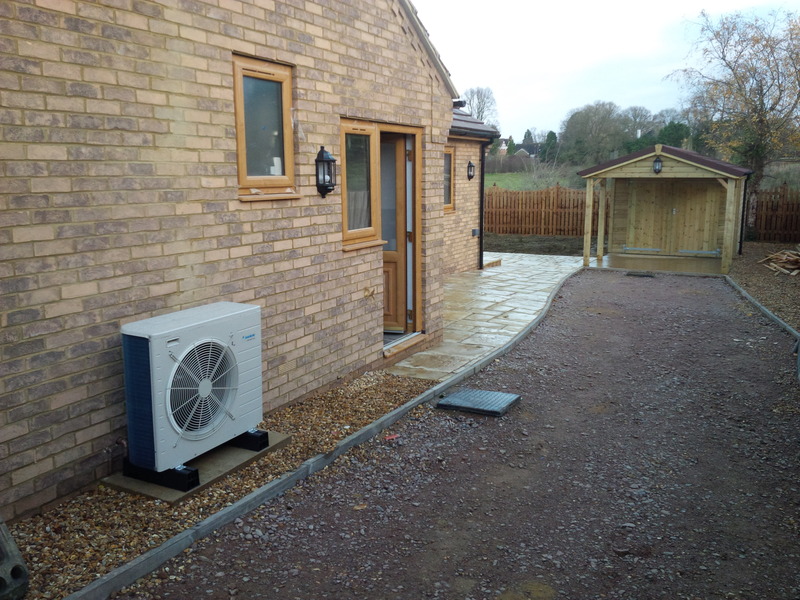 'Split heat pump' - Griffiths preferred system. A split heat pump system comprises of an internal 'hydrobox' heat exchanger unit (Similar in size to a conventional wall hung boiler), an external evaporator unit and refrigeration pipes connecting the two. The benefit of the split heat pump system is that all central heating services remain within insulated envelope of a property. The heat transfer from the refrigerant to the central heating water occurs within the hydrobox. 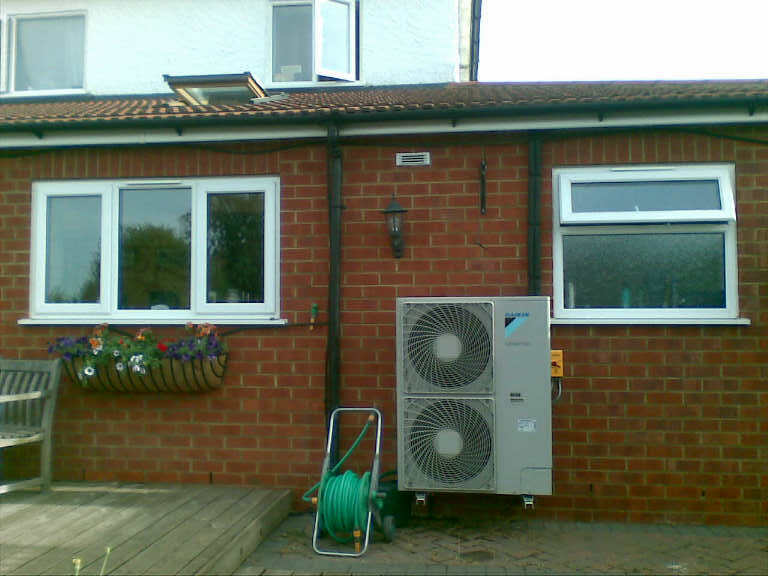 'Monobloc heat pump' - The Monobloc system contains all the components of the split system, however these are all contained within a larger external unit. The Monobloc offers the benefit of saving internal wall space (as there is no internal unit). 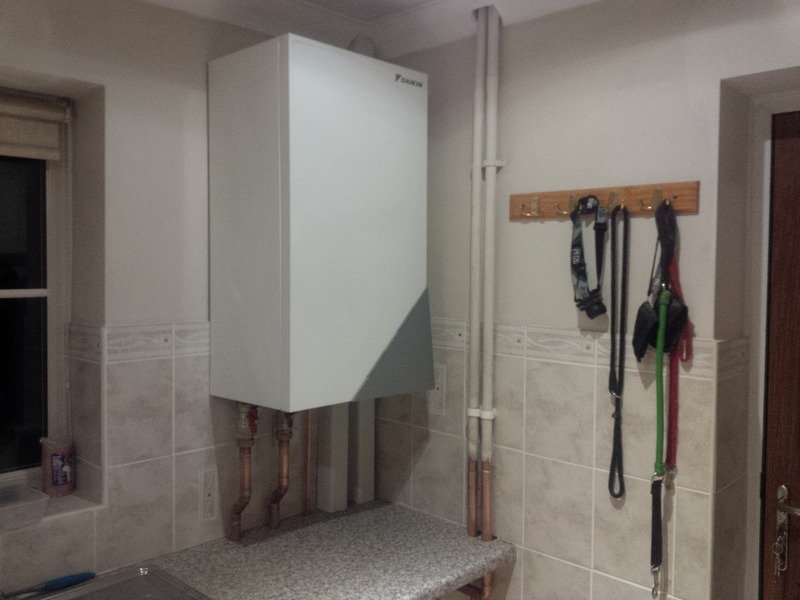 However this system requires the central heating services be plumbed to the external unit. As piping services are being taken outside, the whole central heating system is required to be dosed with a glycol to prevent freezing when the equipment is switched off. This can lower system efficiency and require specialist equipment to recover if additional works are required on a system. 'Inverter' - Daikin's Altherma air source heat pumps all contain inverter technology. The inverter drive converts mains AC (alternating current) to DC (direct current) electricity, this allows the system to vary to frequency of electrical pulses to the compressor, modulating its output. 'Weather Compensation' - A feature on all Daikin Alterma heat pump systems. Weather compensation modulates the temperature of water circulating in a central heating system, depending on outside air temperatures (I.e. Radiators getting hotter when its gets colder outside). The feature provides maximum the efficiency of the heat pump system. For each installation Griffiths shall undertake a full survey of a property, estimating a room by room a property's 'heat loss'. For new build property's this can be undertaken from drawings. On existing homes a full appraisal of the existing central heating system shall be made, with recommendations of additional efficiency improvements which can be made. A bespoke heat pump system design is undertaken. A system shall be selected to meet seasonal and peak heating demands, with consideration of hot water usage. A full quotation/system specification is produced detailing our selected system, estimations are provided of running costs and potential government funding. Installation of heat pump system. System commissioning and hand over.